While it's always been difficult to pinpoint the reasons behind the musical urge (or addiction), there does appear to be a segment of society that thrives on the benefits of organized sound. I guess that musicians and composers are contributing members of a distinctive clan - or share a common mutation of genes that promotes the impulse within our environment. Taking the long view, I've been impressed with the scientific discoveries that have been made in our life-time: Gernomics, Information Technology, Robotics, AI, Physics, Astronomy, Medicine, Brain-imaging with fMRI, Biotech, Mathematics, etc, etc, etc. It's a completely different world today than what existed in our childhood. And yet, if you peal away all the superficial aspects of musical expression and look at the fundamentals, Music is basically an age-old art-form more akin to religion or some esoteric philosophy. If you have to ask "why" or "how" music is so pervasive and influential, you are either asking the wrong question or oblivious to the inherently vaporous patterns of the basic impulse. It's clearly more intuitive than scientific. But, sometimes when in a state of dubious rationality, I do question the blind faith that is required to accept the fundamental premise of the musical experience. Taken as a whole, the status quo often seems so relative and arbitrary. Is it possible that our artistic lives are based on a falsehood, that music is nothing more than a residual organ of an obsolete cultural norm? Or, as practicing musicians, are we way ahead of our time and in fact early practitioners of a brand new, yet-to-emerge, science? At present, I remain on the fence: a Musical Agnostic. The 75th season of the Tanglewood Festival coming this coming summer will premiere works by eight composers: John Harbison, Michael Gandolfi, Andre Previn, Gunther Schuller, Edgar Meyer, Ju Ri Seo, Adam Roberts, and Matti Kovler. How does the cultural hierarchy amass itself to select winners and losers in the arts, and what common methods, strategies, and so-called “best practices” do they deploy to determine results from a selection process that is (for the artist) not always transparent or obvious? My interest in this topic stems as much from plain old curiosity as it does a self-interested desire to be understand the rules. After all, hasn’t everyone wondered at one time or another how and why this or that contemporary work - and the artist who created it – was a success, while many others were not? Finding a rationalization for this process is something that composers in particular should be cognizant of, since as professionals they are significantly invested in having their music performed and in the integrity/viability of the selection-system as a whole – to say the least. As a composer myself, I strive to observe and understand how this process plays out in the arena of contemporary serious concert music, although to be honest, the subjective data I’ve gleaned thus far only provides a faint hint of the obscure rules that lay underneath. And yet, subtle indications of a mysterious systemic process rise to the surface and reveal themselves to those who pay close attention to the details. The selection-system in the field of music, as I see it, is fairly generic and generally applicable to other fields of art as well. But how do we construct a viable theory out of fleeting impressions if we can’t peer directly into the black box of social interaction and observe for discernable patterns of information on which to base our claims? What if you can’t be a fly on the wall and observe the powerbrokers at work? Having never been on a jury myself, I can only base my theory on cumulative results and outcomes of the selection process rather than on an internal narrative that occurs behind closed doors. We can’t see the hidden processes that hide beneath the hood and out of public sight. Although events of day-to-day decisions that reflect and represent inner-mechanics and social patterns that lie submerged are clear enough, it’s the larger trends and the patterns they form that are much more difficult to grasp. Local events generally exist out of sight and out of mind, and are distributed over the course of years of activity and spread among many individual recipients working in isolation. But the establishment always maintains the upper hand. The long-term impact of their positive or negative rating forms an over-arching and cumulative series of events that ultimately creates the pattern of winners and losers. Their mission is decidedly strategic, although they claim to be open-minded and neutral. Acknowledging there is actually a systemic gateway for art and that it functions on a grand scale could be considered socially taboo, since the conventional wisdom is that outstanding and unique original art (and music) will always bubble up to the top of the vat to reveal itself as a superior product. It’s another incarnation of the survival of the fittest principal. We are trained to believe that true talent can’t be suppressed. On the other hand, it’s painfully clear to many observers that the number of producers of art far outnumber the limited supply of cash-carrying consumers. By hook or by crook, society must rely on a methodology to filter out (as with a cultural “sieve”) the “worthy” from the “worthless.” This concept is nothing new. The assignment of artistic value is an age-old process that has found application throughout time and across culture – yet this all-important filtering mechanism is also underplayed, perhaps in the interest of perpetuating the mystique about the greatness of individual works of art, artistic movements, and even colorful narratives about individual artists themselves. One thing is true: without a working conscious or unconscious filtering process, the public would be completely overwhelmed, besieged with information and the market (by which new art and new music is created and sold) would collapse under its own weight. Several key factors are at play here. For one thing, there is good art and bad art, but unfortunately not everyone can (or will) agree on a unified criterion of aesthetic judgment to make value assessments on a universal or collective basis. There is no gold standard for art of exceptional quality, and if there were, we’d have other problems to deal with. Some see the selection filter in purely financial terms. They mistakenly assume that art will succeed only if it has commercial potential, even what could be considered a niche market. I don’t take that view. It’s too simplistic. While it is presumed that every consumer has a right to make decisions about what is good or bad art, by practical necessity most people tend to defer to eternal experts or specialists to help them form an “opinion” of their own. Here is where professional pundits and power brokers enter into the picture. Often they lend themselves out as experts - even as judges on decision-making committees - and directly influence the outcome of awards, commissions, and grants. It’s rather mercenary. Several systems and mythologies have evolved over time to satisfy the need to limit the quantity of art in an open and free market. While anyone with means can produce art, the arts establishment oversees commerce in a marketplace that is internally subject to rules it establishes, controls, and self-regulates. It’s fundamentally a dark market, and its operations occur behind closed doors and out of public sight. The public has no idea about what the rules and regulations are, or how decisions are ultimately made. Even worse, the rules and their application are opaque to the creative artist as well. For a sense of direction and cognitive security, consumers of art sometimes look for prevailing winds, and when they find it, fall in line with their cohorts like a flock of Canadian geese heading south for the winter. They follow this or that trend according to the dynamics of horde psychology. Following along with the masses has become a prevalent mode of group-based decision making in the information age where the number and veracity of Internet-driven spikes is a precise metric for social networking sites, and ubiquitous access to multimedia has made everyone a potential participant. To put this in historical perspective, we should acknowledge that many artistic movements are as much the result of consumer fad as they are the product of a genuine artistic resonance based on a particular collective idea shared and distributed by the creator. I don’t advocate suppressing fad, but I do suggest that artists and consumers rise about the fray, self-educate, and become cognizant of the mechanisms that potentially fuel the fire of artistic movements – right down to understanding how limited resources are distributed to individual artists, musicians, and composers (or their constituent support organizations). Perhaps it is because resources are so limited (and dwindling as we speak), that a cadre of so-called arts management professionals and self-appointed experts have inserted themselves to refine the process. In some cases management professionals have pre-selected concert programs before the musicians contracted to perform it have had a chance to provide their input. For these experts, randomness is neither virtuous nor a functional component of their organizational toolkit. Almost by definition, these people want complete control over the selection process and seek to wield absolute power in shaping concert programs (and ultimately the careers of those they manage). In the end, their well-intentioned (but usually misguided) actions determine what the public will be exposed to. Arts organizations experiencing financial stress tend to listen to their wise marketing advisors who may (or may not) have a personal aesthetic axe to grind. But as self-proclaimed experts, they allegedly know what’s best when it comes to the bottom line: ticket sales. Randomness - on any level - is their enemy, since they can’t control it. The status quo in concert management is to propose and recommend a moderately conservative menu of musical offerings. This approach most often results in solutions that are predictably pre-determined and limited. Using their approach, the number of new works scheduled for a season will typically be very limited (if indeed any local or world premieres are scheduled at all). The prototype program offering of a major symphony orchestra is a case in point, where one hopes that the Music (or Artistic) Director is given at least some artistic leeway to create the season’s program. But it is more likely today that members of the Executive Management team will either lead the effort, or be heavily involved in the selection of actual programs (although in Europe there is a more complicated tradition to involve a mix of orchestral members in the program selection process). The problem with the “music selected by committee” approach is that in the end there may be little if anything on the smorgasbord that actually appeals to the overall public’s sensibilities. It tends to promote a generic (and boring) outcome. On every level music ensembles are caught between the rock of selecting what a select few might consider interesting and exciting music verses the hard place of a boring alternative that will bring in a broader audience and hopefully maintain (if not increase) ticket sales. And as we have learned, what works in the short-term does not always translate to long-term success. In some venues, concert programs are still “curated” by an Artistic Director with a particular point of view – which may or may not align with the interests of composers on one side, or an audience on the other. But at least with this singular approach, a unique vision is presented, implemented, and allowed to sink or swim based on its own intrinsic merits or limitations. Public radio is an interesting example of a system where music was at one time selected by an individual DJ with a particular set of ideas and preferences. If you disagreed with their individual selections of music, you could always turn the dial to another station that conformed to your tastes or wait for the next show. Over time, commercial and public stations merged and their net number of listeners for a particular program grew. Management felt that in the new commercial paradigm the task of selecting specific music to broadcast was far too important on the bottom line to delegate to individual hosts or DJs. Behind the scenes, radio stations adopted committees of experts and consultants to analyze and tailor programs of music based on surveys, analysis, and studies. It’s now all very scientific, like Muzak. The result of this change is that the independent selection of music for broadcast by local DJs was superseded by pre-selection of works (or at least categories) by a global committee. Their aim and objective was simply to apply pseudoscientific methods to appease the largest number of subscribers and maintain or increase market share as well as to centralize and optimize budgets. Many people have an aversion to rationalizing the pre-selection of art by systemic means because of a widely held assumption that the consumption of art transpires on a purely emotional level. While both hemispheres of the brain are important factors on the receiving side of the artistic experience, many social and economic hurdles still have to be negotiated by the artist post-creation of his or her work. Although their work may be “pure” or even inspired by the aid of a creative muse, it ultimately has to go to market. In this regard art is a product, and in this sense it is no different than fish, coffee, fresh produce, hamburgers, or pork bellies. But what do we mean by “professional” and how does society formally or informally assess Composer X’s success in the field? In an uncertain market, what are the criteria by which success and failure is measured? What framework is used to regulate the system or make selections? If it were a business, we could ask for a balance sheet and an analysis of the corporate metrics, but struggling artists and emerging composers don’t come equipped with that data. Even if such things could be measured objectively, our culture is not inclined to think of art in those terms. It really seems that an entire infrastructure has evolved to assist modern society with the fairly ugly problem of narrowing down the selection of art before it reaches the public’s eye. Specialists and experts have appeared out of the woodwork to fill this niche. For example, to simply the process, consumers often read the recommendations of professional critics for helpful advice. Conversely, critics feel a responsibility to guide their readership in the “right” direction. While I agree there is a role for the well-versed music critic, since on occasion they can provide a common thread for public discussion centered on one or more important topics, there is a risk that critics can become more than mere commentators and cross over the fine line into a role of cultural activist. This editorial transgression should stand as a clear and present danger to the integrity of the selection process. Critics who take sides in the musical or artistic debate do so without actually being a direct stakeholder. For the most part, they are not creators themselves. The media’s recommendations often carry considerable weight. For instance, when a city-wide newspaper publishes their selected “picks” of concerts and venues, the beneficial impact on the featured presenting organization can be rather significant. But the adverse effects on artists and presenting organizations routinely ignored by the press tend to be equally devastating. For them, being ignored is poisonous. On another front, academia has self-appointed itself as a mediator to provide formal credentials for artists and composers who seek to obtain legitimacy in a woefully over-saturated market. In the hope that a MFA or DMA will provide a competitive edge over their peers, many artists and composers have invested heavily in this academic-based strategy. While some musicians have on occasion found this career path fruitful, the formula has been less successful in recent years and appears to be losing steam and credibility as time marches on. I sense that audiences care less these days about the quality and quantity of degrees listed on a composers’ bio. With a market flooded by credentialed artists, the credential itself becomes less of a distinguishing factor. And yet credentials seem to matter. A number of new music specialty ensembles in my geographic area appear to perform works by the same small group of credentialed composers more or less ad nausium. I find it interesting that some of these same ensembles are recipients of various awards for “Adventurous Programming.” What’s so adventurous about performing works by the same two dozen mostly academic composers over and over again? Academia is heavily involved in controlling the filtering process at the source of funding as well. This occurs in instances where a foundation is based at, and administered by, a university. The significant potential for conflict of interest lies here, since the same organization that assigns credentials is tasked with distributing benefits and awards. The filtering process in this context tends to weigh heavily on personal connections and preexisting relationships. Academics tend to award other academics, and inside-politics has been known to reign. For example, if the jury of a grant selection committee were to actually listen to all of the recordings of the submitted works, they would never have enough time to listen to everything that was submitted. Therefore the trend has been to use a system of selection criteria that typically filters out the unwanted based on factors of familiarity and personal bias. From my experience on the submitter side of this equation, this filtering method is not optimal either. Government subsidy of the arts is related to his discussion in that public money is often used to fund art projects – particularly major ones. I’ve seen both good and bad outcomes from art projects funded by Federal and State agencies in the US and by various European subsidies as well. While this discussion is not about the merits of public funding of the arts, it does raise the issue of cultural filtering when governments are forced to cut back on funding (as they have recently in Europe). The painful discussion about how and where to make these cuts becomes even more relevant when funds are in short supply. Deciding about what to sponsor in the arts is the mirror image of deciding what to cut. Recently in the Netherlands, politicians have decided to take a populist route: future funding will be determined the financial “success” of organizations. The hard metrics of audience size and ticket sales will become the primary determining factor of future support. I find the “popularity contest” method of filtering to have significant limitations too. It’s an American model, and (from what I can see here in the United States) it does not serve the interests of those who hold a minority perspective in the arts. While select commercial ventures could exist on their own without the infusion of public monies, there is a much smaller market for certain art forms – including some important cultural warhorses such as the chamber and orchestral music. The classical music industry has from the outset never been completely self-sustaining, so it’s simply Pollyannaish to believe it would thrive (or survive) in a purely free-market economy. Recently two commercial British musicals won Tony Awards, which in itself is not surprising other than the fact that the British Government provided seed money to the producers of these stage works. This initial government funding allowed for the kind experimentation in theatre that is not likely to occur with free enterprise alone. My argument is not about reducing funding for the arts (in fact I think it should be increased), but about re-evaluating the means and process by which it is allocated. Internet-driven crowd-sourcing is an interesting recent variation on the popularity contest. It uses Information Technology to systematize the mass market tabulation of winners and losers. It has commercial application too: collecting SMS texting fees for each “vote” has proven to be quite profitable for Simon Cowell’s American Idol’s empire. The YouTube phenomenon has made more than a few artists famous, if not infamous. Thus far I have surveyed just a few of the methods in use by the arts establishment to whittle down an overly broad spectrum of art and music into a smaller, more manageable pot of finalists. The finalists then compete for diminishing resources of public and private funding, or get voted off of the island. We’ve seen how professional arts managers have a financial agenda that does not always align with artistic trends. We’ve seen how the juries at foundations often resort to personal bias and inside politics as a filtering method – usually out of practical necessity. We’ve seen how some professional critics inject bias into the public arena and use the power of the media to influence the filtering process. We’ve seen how academia has attempted to influence outcomes by throwing their weight behind their graduates and using credentialing to validate one class of artists over another. We’ve also seen a recent trend to filter art using the tools of social media with “crowd-sourcing” to empower the public through voting electronically for whatever they desire in the moment. This is impulsive and art by the numbers. Frankly, I’m not a fan of any of the above methodologies. Yet, I fully acknowledge that not everyone can be an artist. As ugly as it, there needs to be a filtering process of some sort. That’s a reality. Let me propose an alternative system: that of randomness. When someone has an encounter with art that is purely random; something clicks and the resulting experience is often quite positive and memorable. Serendipity has always been an important factor - not only for the consumer, but for the creator. With human nature being what it is perhaps the best way to bypass back-room politics, personal bias, and insider trading in the art markets is for the distribution of funds and awards to be randomized. Randomization would equalize the playing field and virtually eliminate the potential corruption of committees and outside influence of self-proclaimed experts. While using chance does not guarantee that the “best” work of art will always be selected, it does provide a wider spectrum of options and more points of view than we have today. After the work is initially presented to the public, its intrinsic value is open for interpretation and vigorous debate. The new work will ultimately sink or swim based on its own merits. But the issue we face today is that poorly filtered selections of work make it to the public. By randomizing the selection process we would do a much better job at picking potential winners for society. Randomness is not to be feared. For example, I am an advocate of open stacks in the library where one can browse books at will and discover new ideas purely by chance. Although I have a very extensive audio collection of recorded music, I often prefer to listen to the radio because the selection of music is out of my control. Random selection takes us beyond our narrow box of ideas and concepts, and can provide us with experiences that would not be part of our self-defined set of values. How does one implement a system of randomness? I propose using a lottery system to achieve this goal. It’s rather easy to implement and would save funds and reduce (if not eliminate) administrative overhead. Artists would simply apply for a grant by obtaining a lottery ticket after establishing that they met a minimum set of requirements (the subject of another discussion). Foundations and cultural organizations would hold periodic lotteries to select the recipients of their awards or commissions. It’s that simple, and completely fair. It’s as easy as rolling the dice. You can’t get any more efficient than that. It would require a paradigm shift for cultural organizations and foundations to demote their managers and panels of experts and migrate toward an organized system of chance. But I’m convinced that positive surprises would ensue from the adoption of this new filtering method, not to mention the fact that it would be far more equitable all around. At worst, the lottery system might provide results that are just as mundane or drab as the offerings we have today as the result of filtering by the existing pre-selected calculation methods. Nothing could be more boring than determinism in the arts, and randomness can stir things up. Under the current system, the more awards an artist accumulates, the more suspicious I become of their work. Art should be about original ideas, not about an artist’s ability to schmooze and work the system to their advantage. If it does nothing else, the lottery system equalizes the playing field. Is it fair? It depends who you ask. Certainly well-established artists and composers might feel threatened by the idea that their next commission or grant would be awarded on the basis of a lottery. But for many others, perhaps the majority, it does provide at least a chance of success and access to potential financial and artistic resources that they have difficulty accessing. While the odds would not be in any particular recipients favor and generally quite low, at least every basically qualified artist would get an equal shot at the prize. Some will argue that with a lottery system everyone will suffer. This fear is overblown. The truly committed with continue their work and regularly apply for funding and commissions via the newly instituted arts-lottery system - while the dilatant will grow bored and seek other ways to pass their time. Those who apply more often will improve their success rate. In some cases an individual would have an equal (or better) success rate with the randomized selection method than the existing systems of selection utilized by the status quo. Ultimately, the proposed lottery selection system would be generally accepted by the majority of creators of art and music, but it would also hold tangible benefits for the public at large too. Some of its positive outcomes in the field of music would include randomized listening tracks on the radio, new pieces of concert music by completely unknown composers, and an open and unregulated playing field unhindered by politics. These would all be welcome contributing factors to a newly vitalized new music scene, and I would embrace all of them as a positive trend toward something better than what we have today. •The première of Beethoven’s Ninth Symphony in 1824 in Vienna. •The riot that occurred when Igor Stravinsky’s ballet Le sacre du printemps was premièred by the Ballets Russes in 1913 at the Théâtre des Champs-Élysées in Paris. •When Leonard Bernstein - having recently been appointed assistant conductor of the New York Philharmonic Orchestra - stepped in on short notice for an ailing Bruno Walter in 1943. •When Van Cliburn achieved worldwide recognition in 1958 at age 23 by winning the International Tchaikovsky Piano Competition in Moscow. •When Jimi Hendrix achieved fame in the United States following his 1967 performance at the Monterey Pop Festival. What are your defining moments in music? I began this blog over three years ago after losing my day-job. At the time I thought it would be good to record my activities, thoughts, and impressions in a format that resembled a diary – only online and available to friends, family, and anyone who cared enough to read it. As the blog progressed my primary area of focus morphed into an open-ended discussion about my thoughts on music and other random rants of the day. My semi-frequent posts have tended to focus on aspects of contemporary music composition and items of interest that relate to it in the periphery, both historically and in the present. In retrospect, “Deconstructing-Jim” has also served to function as a personal digital soapbox and electronic therapist in an age where, in the spirit of Reality TV, it’s socially acceptable to spill ones guts online. I’m appreciative of all those who have read my blog posts over the past years and have taken the initiative to contact me, reply online, and find out a little more about my music. In the end there has been value if this blog leads one to consider (or reconsider) aspects of my musical work. Over the duration, it’s been an interesting ride. My blog posts have included random (and not-so-random) thoughts about the challenges of being a 20th/21st century composer, including some of the more mundane and practical matters of self-sufficiency and self-preservation. It’s a story that often goes untold. Yet, I think it is useful at times to explain to the public what many composers actually do to earn their living, and how they maintain their motivation over the long haul. The game of survival often involves jumping through hoops like a circus dog just to make ends meet and to move on to the next level. Everyone knows that not all composers have the privilege and support of a university position, or even the sporadic income of royalty checks, and/or major commissions. But there are some - a lucky few - who are in that position. If they are diligent and disciplined in their work, they will be successful - almost by default. I’m not one of those composers. For me, the music profession has never been fertile ground for generating income. For better or worse, I have never earned a penny from the trade. I’ve never held a teaching job, taught private students, or received a paid commission. It’s not that I haven’t applied myself, but rather that the music I create has had (for whatever reason) minimal commercial success. Fortunately I’ve been able to survive into middle age with most of my teeth and all of my fingers by working day-jobs of various sorts. I’ve been employed as a dishwasher, security guard, retail sales clerk, house painter, technical trainer, car salesman, technical instructor, and made a career in IT for a time. Some of my day-jobs have been better than others, but all of them taught me something. I’ve also been fortunate in that my wife works (albeit part-time) and has benefits. As a family we’ve been able strive toward the iconic middle class American dream, even though I have made vigorous efforts on the side to promote my own music and career in whatever way I can. I have to say that given the challenges, when trying to balance composing music with earning a living, all has gone fairly well. That is, at least up until now. After the loss of my full-time job and benefits in 2008, my personal financial position has declined. As we all know too well, the economy has taken a precipitous plunge into the abyss of recession. The unemployment rate in the US is officially over 9%, but some say that in reality true unemployment hovers around 20%. Any semblance of financial recovery does not seem imminent, at least not in the next few years. The experts say it may take decades before things return to normal. Since 2008 I landed some part time and temporary contract work in IT for a period, but that also came to an abrupt end. The latest news is that our family lifeline, my wife’s long-term steady job, may in jeopardy due to corporate reorganization. The timing could not be worse since the employment outlook is dire. After having no success applying for jobs in IT or in higher education, it became clear that I couldn’t continue to burn through personal savings in the hope that the US economy will turn around anytime soon. I found myself applying for entry level jobs that pay a fraction of what I once earned. Yet, even those jobs are now more difficult to acquire - especially for someone in their late 50’s. At one of many job fairs I heard a story about an open position at Barnes and Noble in downtown Boston that attracted 1,000 applicants. That dire fact is fairly representative of what it’s like in the general job market today, and it’s pretty unsettling to anyone who is unemployed. Recently my luck improved. I was invited to a job event hosted by a large supermarket chain. I spent the day interviewing with them, and came away with a job offer. That’s the good news. The bad news is that the salary is $10/hour. After some consideration, I accepted the offer and have begun work. In my new role at the supermarket is working as a bagger. I’ve done jobs of this sort before. I can do it again. Although standing on my feet for eight hours a day will be a challenge, I’d rather work than not, be able to pay my bills, and not fall into debt or spiral in downward path financially. I also have a son who could use our assistance in paying his college tuition. I am grateful for the income. My emotions about my new day-job are mixed. While it is a relief to finally find something after such a long search for employment, it also is unsettling to know that trying to live on a much lower income stream will be a significant challenge. I’m also perturbed about the current economic impact that has resulted from mistakes made by a number of our country’s political leaders, policy makers, and by the grandiose power grab by greedy corporate executives that initiated the global financial meltdown in the first place. And yet I realize that I’m in the same sinking boat as many Americans, and better off than a lot of them. But it is disconcerting to realize that what I thought would eventually be my retirement years now seems so much farther away in time. It’s as if my retirement future has disappearing from sight as it slips over a moving horizon in a Las Vegas magic show. Counting the additional years to retirement creates a sinking feeling. I’ve long accepted the fact that I’ve never been able to compose full-time as a profession. That dose of reality has always been mitigated by the notion that I could use my retirement years in pursuit of that lofty passion. Now, unfortunately, even that goal looks less promising. The success and survival of the new music trade is more important than the success of any particular individual. For that reason I’m glad that at least some of our nation’s composers are thriving and able to create work in the down economy. At least there are still some resources available to them. There are only a limited number of commissions, university jobs, and prestigious foundations to support and aid their work, and I’ve come to conclude that there is just not enough funding to go around to support a broader spectrum of composers such as myself. The tendency has been to award commissions, grants, and academic accolades to composers who have already demonstrated success – based mostly by the quantity and quality of awards they have already received. My unscientific analysis indicates that: as more awards and distinctions are presented to a composer, the more he/she is inclined to receive them in the future. It’s an interesting relationship. [Nassim Nicholas Taleb calls this the “Survivorship Bias”]. I do believe that it is important for someone fill the societal role of “professional composer” since a world with a few good pieces is better than a world without any. Given the state of the U.S. economy, not everyone in the field is worthy of that unique privilege. My new job as a supermarket bagger is physically demanding. Pushing trains of shopping carts in from the parking lot tires me out. Standing all day is an acquired skill. It’s human nature to lend our attention to those who have acquired Stardom and the accruements that come with it, namely: fame, success, and personal wealth. Movie Stars, TV Personalities, and Pop Music Icons are among the household names that everyone – I mean everyone – knows. It’s as if in mass-culture we assume that everyone has a basic understanding of the most popular trends in art and music. For several generations now, media has been the de facto conveyor of popular aesthetic norms, and anyone without cable television and/or broadband Internet access will find themselves solidly on the wrong side of the proverbial Digital Divide. While I have accessibility to new media today, it wasn’t always that way. After graduating high school in the early 1970’s I went off to college and for several decades intentionally lived in a self-imposed cultural bubble. It’s as if I choose to limit the sensory input of mass-media around me, and focus primarily (and very intensely) on a select area of musical endeavor: contemporary concert music. I attended live concerts constantly, hung out with practicing musicians and composers, and fully immersed myself in what I found to be exciting new music scenes in Boston and New York. I considered this to be part and parcel of learning my trade, and an essential ingredient for developing my personal style. The only technology that connected me to the world was a rotary dial telephone, a record player, and a FM radio for the news. Filtering out mass media, and the pop culture that fuels it, has a downside too. One can quickly become a nerd and social outcast. Even today I often feel like an alien in my own country when people I meet discuss personalities and celebrities I’ve never heard of. Social settings can be awkward. Conversely, many of the musicians and composers that I know (and who inspire me) are virtually unknown to everyday individuals. It’s a sad fact, but I’ve gotten used to it. Fortunately, there are still a few who co-exist with me in my cultural bubble. It does seem that the bubble population has been in decline as the elder members, the old guard of the new music cult, pass away. But through the magic of social networking and with the influx of a few eager, similarly-minded souls, there is still enough oxygen in the bubble to provide the elements of basic life-support. My cultural bubble included some late, great heroes - “eminent” composers that not everyone has heard of: Milton Babbitt, Arthur Berger, Luciano Berio, John Cage, Edward T. Cone, Ross Lee Finney, Lukas Foss, Andrew Imbrie, Leon Kirchner, David Lewin, György Ligeti, and my teacher Donald Martino. Other composers, still alive and active in the bubble today include: Pierre Boulez, Elliott Carter, George Crumb, Mario Davidovsky, John Harbison, Meredith Monk, Shulamit Ran, Steve Reich, Gunther Schuller, Stephen Stucky, Charles Wuorinen, Yehudi Wyner, Chen Yi, and Ellen Taaffe Zwilich. That's quite a diverse group. All of the composers listed in the paragraph above are examples of musicians who have exceled to the highest level of accomplishment in the field of contemporary concert music. They have written cutting-edge chamber and orchestral works. Although not superstars in the celebrity sense, they’ve achieved a modest following within the field and won the respect and admiration of their peers. If there is a valid measure of success in the niche discipline of new music composition, these composers have clearly demonstrated it. What I find strange about current trends in culture is the idea that a cultural bubble (such as the one I was nurtured in) is in some way academic or elitist. If one looks from inside the bubble to the outside world, it looks a little different. My decision to self-isolate during my youth and develop within a limited space was one of personal choice. Everyone has the right to do so, if they wish. At least some people have opted to limit their exposure from the onslaught of mass culture to focus on the finer details of a different brand of art and music. It’s not elitist to focus one’s attention on a narrower area of expression by filtering out the collective noise of modern society. True, some practitioners of contemporary music composition are employed by a university, but I wouldn’t hold that against them. Everyone’s gotta make a living. Not everyone has the resources, notoriety, or income stream of a celeb. But not all academics are academicians. Let’s avoid guilt by association as a default argument. The list of composers mentioned above was of inducted Members (and Honorary Foreign Members) of the American Academy of Arts and Sciences (AAAS) in Somerville, MA. The AAAS is one of the several long-established pillars of scholarly accomplishment. Its “elected members are leaders in the academic disciplines, the arts, business, and public affairs.” The Academy was founded in 1780, and has been one of the few non-profit scholarly organizations willing to recognize and endorse serious composers on an equal footing with professionals in other distinguished fields. Kudos to the AAAS. But recently the AAAS seems to be allowing itself to be swayed by the monolithic gravitational force of pop culture. In recent years, the numbers of musicians inducted into the AAAS have broadened in scope. While fewer composers of serious concert music have been admitted over time, celebrity-artists seem to be making the cut ever more frequently. It’s as if there is a conscious effort by the general AAAS membership to avoid selecting composers who may be avant garde or obscure in favor of entertainment personalities with names that everyone knows. Composers of serious concert music will never be able to compete on equal footing with Rock Stars and Pop Icons. They don’t have the name-recognition, backing, wealth, or fame that goes with that job description. That’s one of the reasons why an organization like the AAAS should exist, to provide recognition and support for artistic creators with a minority viewpoint. The size of an artist’s audience and bank account should not be a measure of their creative or professional success. I have nothing against Rock Stars. I hold no ill feelings toward them. However, before you send threats and hate mail my way, let me admit that I too appreciate what they do (for what it is). But, I have to wonder what the broader social value is of inducting Superstars into the AAAS? What benefit or value does Bono (Paul David Hewson) derive from his AAAS membership? (Mind you, Bono’s election to the AAAS was based on his career in music, not for his admirable work with the UN, social justice, and charity). 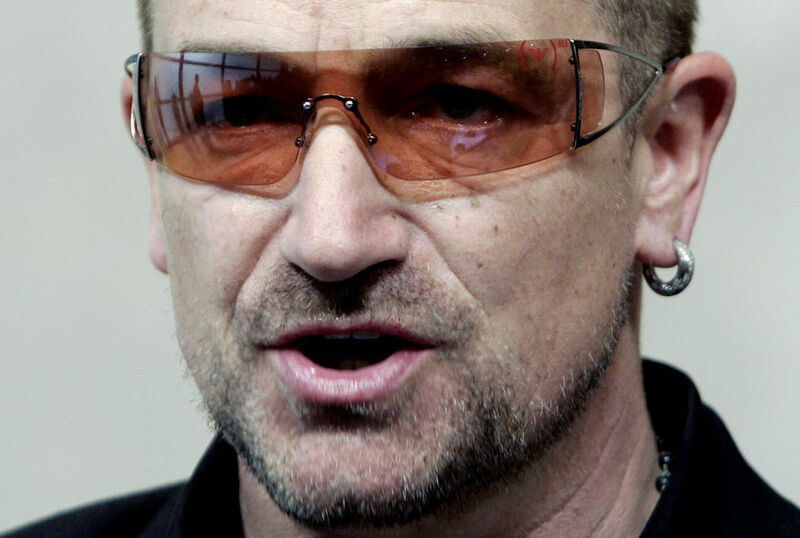 Bono's rock band U2 is said to have earned $195 million dollars in 2010 [Forbes]. For the Class of 2011, the AAAS will induct singer-songwriters Bob Dylan, Paul Simon, and Leonard Cohen - while not a single composer of concert music will be admitted. Do Megastar celebrity artists actually give a hoot about the accolades of academic distinction? On the other hand, most composers of serious concert music elected to the AAAS would likely regard such appointment as a great honor and a significant milestone in their career. The award has historically lent at least momentary recognition and encouragement to a composer’s life-long creative work. Is this a sign of our times? 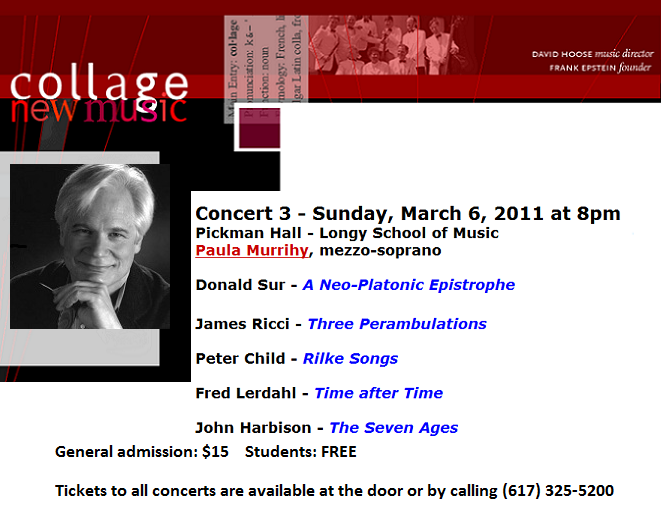 Aren’t there enough living composers of sufficient talent to merit inclusion in the 2011 Class of the AAAS? Could it be that society defines success by how much fame an artist generates rather than the innate quality and uniqueness of their expression? Are there too few serious composers with the prerequisite name-recognition to qualify for inclusion? Offhand I can think of at least two dozen contemporary composers who are highly qualified and worthy of inclusion in the AAAS. In years past, they probably would have been inducted without hesitation. As I see it, this is endemic of a general societal trend toward Populism. Most distressing is the long-term prognosis for my self-erected cultural balloon. It’s one thing when a group of musicians voluntarily choose to isolate themselves from the media hype of celebrity culture to practice their trade within the peace and seclusion of a small self-defined and dedicated artistic community. It’s another when the bubble is rudely penetrated from the outside, and the sanctity of the semi-private artistic space is violated. It’s getting harder to selectively tune out the deafening noise of our collective popular culture. Its presence is all pervasive and persuasive. However I worry that there will still be a place left in the bubble for those of us who prefer to tune into a different, non-commercial radio frequency. But, I admit, everyone loves a celebrity. 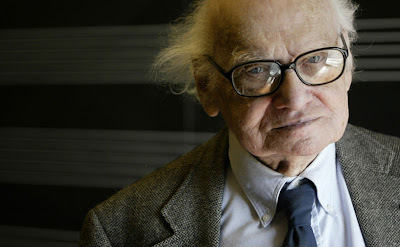 American composer Milton Babbitt (1916-2011) was a Force of Nature. I have never met, and may never encounter again, anyone quite like him. His close friends, colleagues, and students have already published numerous eloquent online tributes since his passing on January 29th. I feel inclined to contribute something too, if for no other reason than to make an attempt at personal closure. I have been a great admirer of his work, and will continue to be going forward. I wish everyone could share my enthusiasm about this man and his music. But how does one begin to describe a person who was truly amazing on so many levels? I find that it’s not easy to summarize my impressions about Milton Byron Babbitt since he was enigmatic in many regards. Babbitt had a multi-dimensional personality, and his music and theoretical writings were as equally complex and diverse. To set the record straight, I can in no way lay claim to have been an official student of Milton Babbitt. While I took every opportunity to attend his frequent lectures and public presentations and met him socially perhaps a dozen times, I never formally studied with him. But over the years we did grow to know each other on a first name basis and shared many mutual connections that spanned across the close-knit network of contemporary music. I was not unique in this regard. It seems that just about every American composer had met Milton at one time or another. He treated everyone he met in his wide travels both professionally and with respect. Babbitt’s academic career began at Princeton in 1938 where he taught hundreds of composers, musicians, and theorists bridging several generations across the many decades of his long university tenure. Along with Princeton colleagues in other fields such as Albert Einstein and John F. Nash, Babbitt earned a reputation as the quintessential Princeton professor by elevating the university’s music department to comparable levels of academic distinction. His reputation was in part that of a teacher. It seemed as if all of my college professors in the 1970s and 80s had studied with him. Princeton was the place they had chosen to study – largely because of Babbitt’s presence (his teacher Roger Sessions was on the faculty as well). My teachers had nothing but praise, respect, and plenty of fascinating stories to tell. One such composer, Donald Martino, was among the list of Babbitt's better-known students. 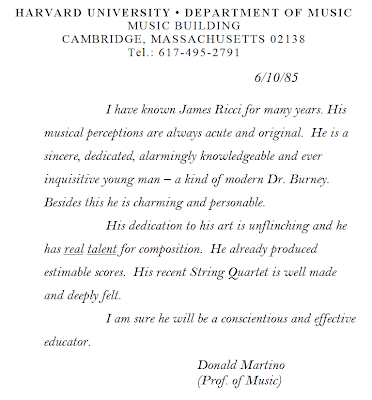 Martino eventually became my teacher at New England Conservatory and Brandeis. It’s probably my connection to Don that enabled my relationship to his former teacher and mentor. For composers of my generation, "Uncle” Milton’s legendary reputation preceded him like a steam locomotive barreling down the tracks. In my youth his electronic music was widely available on LP, his articles were published in Perspectives of New Music, and his notoriety as a new and experimental composer was already very well established. I first learned of Babbitt in high school where his name often appeared in print side-by-side with John Cage. In the late 60s I’d trek from the suburbs to uptown in NY to hear performances by the Group for Contemporary Music of Babbitt’s work by pianist Robert Miller, cellist Fred Sherry, and flutist Harvey Sollberger. These performances made a notable impression on me as a teenager. The music was unlike anything I had ever heard, and it was strangely addictive. Many of Babbitt’s innovative and infectious ideas concerning musical structure and pitch organization were methodically passed down in academia by well-schooled Princeton graduates. If American Serialism could ever be labeled a historic trend, aesthetic movement, school, or ism, then Babbitt fell into the role of de facto leader and public representative - not out of self-motivation or ambition, but simply because he happened to be present at the historic moment and was the best spokesperson for the job. As we all know, times change. Starting the late 1970s and up until his recent death, what might be considered a cultural backlash against serial (or “maximal”) music and everything it represents has progressively gained strength in the broader world of contemporary music. Undeterred, perhaps even spurred on by the stiff opposition and challenge, Babbitt continued his work throughout this period of rising negative criticism, contentious debate, and never-ending negative commentary in the press. As an objective realist he acknowledged that his music was not going to win any popularity contests, even within the small and highly-resilient, self-sustaining subculture of contemporary music. Babbitt was perceptive enough to see that general interest in his unique vision of music had been rapidly waning in recent years. Yet he persisted in forging new and ever-more complex pieces written quite expressly for what came to be a very select pool of dedicated supporters and performers. Reluctantly he had to abandon composing electronic music on the RCA Mark II Synthesizer at the Columbia-Princeton Electronic Music Center for reasons related to hardware failure and technological obsolescence, and began to write exclusively for the new breed of extraordinary instrumentalists and singers who committed themselves to push the boundaries of what is musically possible. They took on the formative challenge of performing his increasingly complex work on traditional instruments. It’s interesting to note that Babbitt’s acoustically generated music takes full advantage of discoveries regarding sound, modern acoustics, and the psychology of musical perception that he acquired during years of hands-on research with the RCA Synthesizer. His early experimentation and creative output in analog electronic music clearly informed his technique for later compositions written for acoustic instruments and orchestra. Initially, I spied Babbitt as an outside observer during the period when he joined the faculty at the Juilliard School of Music in 1973. I heard his Correspondences for string orchestra and synthesized tape (1967) when it was conducted in 1976 by Pierre Boulez at a Festival of Contemporary Music and other works. Babbitt was a frequent participant on various composer panel discussions at Juilliard and elsewhere in NYC, and he always tended to standout with his lucid commentary and articulate discourse on a wide-array of topics during these diverse formal and informal talks. He seemed to be at every significant new music concert throughout the city. After I moved to Boston in ‘73, Babbitt visited us frequently as guest lecturer and composer, partly because his daughter lived in the area. He accepted visiting professor stints at most of the area’s conservatories and universities and was often invited by the local new music ensembles to be a featured composer, including Collage New Music, Alea III, Fromm Players at Harvard, Boston Music Viva, and Dinosaur Annex. At these events I noticed that he always seemed to wear the same suit, and was usually long overdue for a haircut on the sides of his head. His large-frame plastic glasses were an icon, and some of the local grad-students would consciously or unconsciously emulate his 70’s fashion statement. (It is said that the majority of composers in the Music Department at Princeton during the1950s took after Babbitt and became chain smokers). In the summer of 1981 I decided to travel to Indiana to attend a one-week lecture-seminar and composition forum where Babbitt would be the featured Composer in Residence. His wife Sylvia had driven them the long distance from New Jersey (Babbitt did not drive, and Silvia did not fly). On the Monday morning of the seminar I strategically positioned myself front-row center for his lecture in full anticipation of what others had forewarned would be an exciting intellectual roller-coaster ride. After the Dean’s introductory remarks, Milton began to speak. He thanked the Dean for his comments, but corrected him with a smile, “With all due respect, my music is NOT performed by major orchestras all over the world. I wish it were.” And then, without batting an eye, Babbitt began scribbling tiny note heads on the chalk board. First one and then two. Step-by-step he methodically laid out a neat and concise view of a Musical Universe – full of order and logic – like I had never seen or heard before. His lectures that week were scintillating, full of high energy, and mind-bending. I had intended to take notes, but failed to keep up with the rapid-fire flow of information and personal antidote. In some ways it seemed that he was improvising, like the saxophonist he had been in his youth. He lectured for hours on end, and didn’t need to refer to notes. Everything was done from memory. Yet the lecture was well organized, very specific, detailed, and interesting. Years later I discovered some of the same subject matter in the book Words About Music: The Madison Lectures where two of Babbitt’s former students at Princeton were finally able to transcribe and capture the content and essence of his famously endowed pontification. It’s no secret that Babbitt could really talk. He’d take a deep breath, and sentences would flow out like steam blowing from a pressure cooker. But the dialogue always made perfect sense, both syntactically and contextually. His streaming prose was elegantly constructed and a joy to listen to, even if you didn’t comprehend at first the deep meaning, intricacies, and context of the content. His unusually fast pace of speech made it possible for the listener to connect longer strings of ideas and associate them on a much broader scale than we are ordinarily accustomed to. His words were, on some level, punctuated like music itself. The week-long event in Indiana was also an occasion to hear his new work, Ars Combinatoria for small orchestra (1981). Babbitt had just completed the piece, and one of the reasons he was invited out to the Mid-west was to attend the world premiere. In the afternoon while most of the composers and theorists would retreat back to the dorms to avoid a sweltering Indiana summer heat wave, I’d walk across the sprawling campus to hear the student orchestra rehearse his new work. At the first rehearsal Milton sat with his former student John Eaton. I was surprised when the conductor greeted the orchestra and told them that Babbitt’s Ars Combinatoria was a “set of variations.” He then proceeded to point out the bar numbers that mark each variation. I learned later from Babbitt that this was the conductor’s ploy to make the music more accessible to the orchestra. The composer had reluctantly gone along with it – at least for the rehearsals. He confided in me his suspicion that a few unruly members of the orchestra had intentionally conspired to sabotage the performance, particularly the clarinetist. Whatever the motivations, it is clear that the work needed more rehearsal time than had been allocated. Yet it seemed to me that most of the rehearsal time was dedicated to music on the second half of the program - Sheherazade by Rimsky-Korsakov. Undaunted by the shaky rehearsals, Babbitt’s daily morning lectures continued with the same intensity throughout the rest of the week. All of the participants in the lecture hall were simply dazzled by his brilliance, vast knowledge about music, and experience. As part of the Indiana Composers’ Forum, I was to have a work sight-read by the student contemporary music ensemble. Babbitt and my fellow students would be there to observe. Although I had greatly anticipated this opportunity, it turned out to be a little different than I had hoped: the pianist never showed up, the rest of chamber orchestra sight-read miserably. Everyone was out of sync, and the dynamics and pitches were way off. As a result I had a minor-meltdown. After the musicians packed up and left, Babbitt - who had followed my score and knew exactly what I was going through emotionally - calmly said, “Now Jim, tell us about your piece.” I caught my breath, and began to discuss what I had intended to achieve musically. From there Babbitt led an interesting dialogue with me and my fellow students about the craft of musical composition, and about ways in which a piece can be put together and organized. One thing that surprised me at the time was how he focused more on the parameters of rhythm and instrumental tone color than on pitch. For example he thought I had over-used the vibraphone in the piece (having gotten his full dose of the instrument from overuse in 1930’s pop music). In retrospect, he was exactly right. Fortunately I had a recording of the same work performed by a different ensemble, and when my short private lesson with Babbitt occurred later as part of the Composers Forum, we listened to a much better performance on cassette tape. The performance of Babbitt’s Ars Combinatoria occurred on Friday evening. While some of the details of the work may have blurred in my mind and been obscured from the passage of time, the rich sonorities of the music still stick in my memory after all of these years. From what I recall, the piece is chock-full of interesting chords, all uniquely spaced, orchestrated, and voiced. Like much of his music from this period, it’s rather dense in texture. The orchestra in his hands sounds organ-like, or perhaps similar to the RCA Mark II Synthesizer in some regards. Hearing the piece performed live, even in a questionable performance, was exciting. There was an interesting interaction between a member of the audience and Babbitt at intermission just after his work was premiered. It was an encounter that I will never forget. An Indiana farmer wearing a cowboy hat ventured into the university concert hall directly from the adjacent corn fields. He still had his soiled coveralls on, and I imagined that he drove to the concert in a red pickup with bales of hay loaded on the back of his truck. The farmer approached Milton Babbitt and asked a very direct and honest question, “Dr. Babbitt, what is the story of your piece?” (Remember, Sheherazade was the next work on the program). The farmer took Babbitt’s reply as a matter-of-fact answer, and he even appeared to comprehend the self-referential philosophical concept that Babbitt was alluding to. There was no need to supply a footnote to Nelson Goodman’s obscure book “The Structure of Appearance” or reference the detailed row charts that underlay the galaxy of serialized combinatorial structures embedded within Ars Combinatoria. On that hot Indiana night, for farmers, grad students, and composers alike, it was just music. Just having the privilege to meet Babbitt in person (both in social and formal settings), hearing his lectures, being exposed to his music, and attempting to comprehend his complex articles made me a better composer. For me, the amazing thing is that out of all the people I've ever met or have come in contact in life, Milton easily stands out as the most brilliant - by a mile. His mind, capacity for logic, and encyclopedic memory about everything from cutting edge mathematics to competitive sports to the best place to get Southern cooking continued to flow out of his large brain like a gushing reservoir of knowledge. Even when he was in his 90s, it was hard to keep pace with his rapidly spewing thoughts, deep contemplation, bawdy humor, wisdom and insight. He thought, spoke, and wrote music that moved in hyper-speed. Knowing my own limitations, I can safely say that I don't comprehend all the intricacies of his theoretical work. I once privately mused that Milton came from another planet and was dropped onto Earth to share his vast knowledge of a new and advanced ways of looking at things – particularly music. He had ideas that far exceeded what has previously been known in the world, and he shared them freely with anyone who would listen. And yet, he was down to earth. Milton could be funnier than the best of stand-up comics, and at times engaged as a party animal indulging in boutique beer. He was a scholar, a gentleman, a confidant, a family man, and he networked with tens of thousands of people in the profession of music and music theory all across the world. Personally I am indebted for Babbitt for his attempts to assist me in my career. In 1985 he very kindly wrote a Fulbright recommendation on my behalf. Later, he wrote another recommendation to the Fromm Foundation at Harvard. In 2001 after I sent him the score to my newly completed (but yet-to-be performed) orchestra piece Tone Poem, he wrote back that he had decided to nominate me for a prestigious award at the American Academy of Arts and Letters - a distinguished organization where he was inducted as a life-time member in 1965. Babbitt’s support provided a boost to my self-confidence, and I credit him for providing me with courage to continue on in what is often a difficult profession. I was particularly honored that out of all of his students at Princeton and Juilliard, Babbitt decided to nominate me that year for the American Academy of Arts and Letters award. 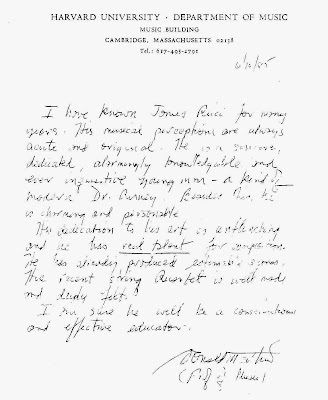 Even though his recommendations and nominations ultimately didn’t pan out in my favor, I can always look back and say that at least Milton Babbitt liked my music. It seems as if every composer I speak with has a similar story about Babbitt - how he helped them in their career one way or another. He always advocated for younger composers, and would not hesitate to stand up to fight political battles on their behalf if necessary. In his last years we corresponded by back and forth by letter. I’d keep him abreast of news in Boston, and he’d always reply back. 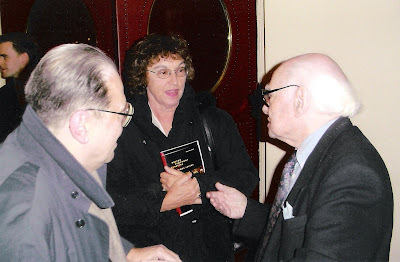 When James Levine commissioned his Concerti for Orchestra (2004) for the Boston Symphony, I saw it as an opportunity to facilitate a meeting between Babbitt and his famous student, Don Martino. Martino had not been in good health. He was recovering from various surgeries and had difficulty getting around. I offered to be his driver, and with Lora Martino’s assistance, Don was able to get from the curbside at Symphony Hall, up the steps, and inside to his seat. He was clearly in a great deal of pain, but wanted to be present for Babbitt’s important Boston premiere in January of 2005. I had given Milton a heads up that we were coming, but mentioned some of the logistical difficulties. After Babbitt’s piece was performed and he returned from his bows on the stage, the Martino’s and I caught-up with Milton by chance at the door just before he reentered back into the concert hall seating area. I happened to have a camera and caught the instant they met. I kept my distance as an outside observer, but the moment was truly instilled with at least a half century of history. Regrettably, the moment was all too brief and it would be the last time the two illustrious 12-tone composers would meet face-to-face. Martino died later that year. 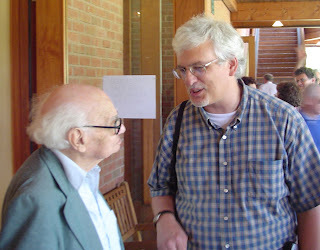 I have always been acutely aware that someday the world would lose its most remarkable people, great composers and mentors like Milton Babbitt and Don Martino. I suppose that is one of the things that made me appreciate them so much while they were alive. In my mind they were heroic. What makes the loss even more challenging is the realization that, at least in the world of music composition, people of that level of talent and ability are an increasingly rare breed. It’s really seems like the void they left behind hasn’t been filled by anyone else.